"No eyes that have seen beauty ever lose their sight. " So if you are alive and breathing you have probably heard the catch phrase for the latest trend "a pop of color". I feel like this phrase is haunting me. However seeing as how the other trend of the moment is color blocking and I would rather cut off my right hand than block colors, I am stuck with this pop of color idea. Honestly the whole pop of color thing is very pretty. It keeps people from looking crazy by letting them have their bright color but in one special focal point. Its a pretty good idea. I have been experimenting with ways to incorporate this trend and a new favorite I have stumbled upon is in your eye liner. 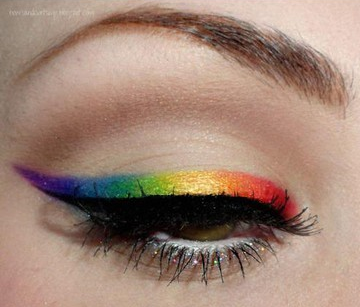 Fun colors of eye liner make your eyes cool to look at and also are a really fast way to get a new look and pull out your eyes. DONT use straight glitter liners for everyday. those are for clubs and cheer leading competitions.